The brainchild of Chinese President Xi Jinping, the Belt and Road Initiative (BRI), previously called One Belt, One Road, is a Chinese economic and development megaproject. 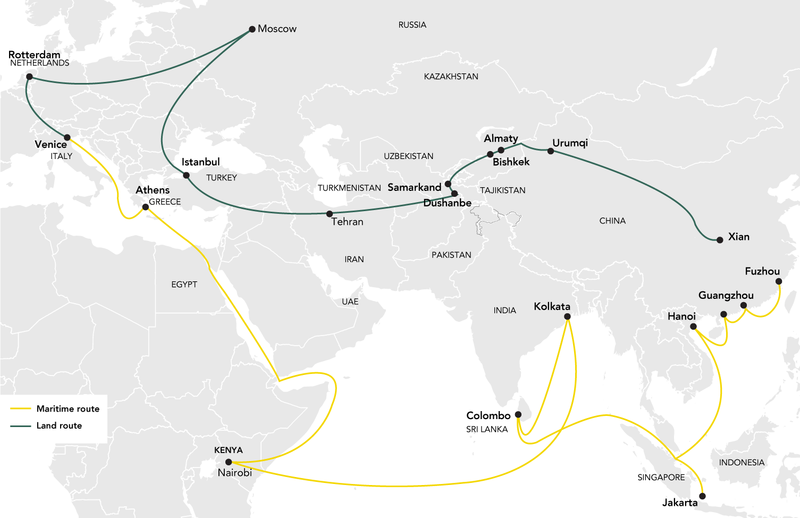 Labelled as the “project of the century” by Xi, the BRI aims to connect China to Eurasia through both maritime and overland routes. The Gulf Co-operation Council (GCC) states are on the official list of BRI countries but the Gulf does not make up a core region for the initiative at this time. Nevertheless, parts of the BRI concept align well with the GCC’s current objectives in the areas of economic diversification, investment, market access, and regional security. Other aspects of the initiative, however, present risks, including the BRI’s engagement with regional Gulf rivals, especially Iran, and the threat that the GCC countries may be largely bypassed. Due to the BRI’s broad and ambitious nature, it remains a rather vague concept, especially for non-Chinese actors. Rather than wait to see what emerges, GCC countries can leverage their existing relationships with China to ensure that projects of benefit to the GCC materialise. The BRI reflects China’s wider economic and political interests, domestic market demands, and Xi’s ambitions to effectively open China to Eurasia. The GCC’s co-operation with the BRI should focus on the parts that represent Beijing’s permanent interests and are therefore presumably the most durable. The BRI is aligned with long-term geopolitical trends – notably the diminishing role of Europe and the United States in the Middle East and North Africa (MENA) – and the rising importance of China and other emerging Asian countries. Political alignment is not absolute within the GCC due to internal dynamics between the member states, with the ongoing Qatar crisis not helping. In energy terms, a divergence of interests between Qatar, the only major gas exporter, and the other GCC countries, is a matter of concern. Some key BRI states are GCC allies, but others are strategic competitors or even adversaries, such as Iran. Options for benefitting from the BRI without allowing it to worsen regional relations and stability require careful assessment. The GCC’s positive relations with allies such as Pakistan and Egypt can further Chinese energy projects in these countries, especially those that benefit the GCC – for example the pivotal BRI Gwadar port and pipeline project in Pakistan and the BRI’s investment in Egypt’s Suez Canal Area Development Project. The GCC should consider how other states in the region and beyond, including the US, India, and Japan, may react to the BRI and related initiatives, whether co-operatively, neutrally or obstructively. The BRI converges with current and long-term energy trends such as the decreasing importance of MENA oil and gas exports to Europe and North America, and the rise of China and emerging Asian states as key global energy consumers. 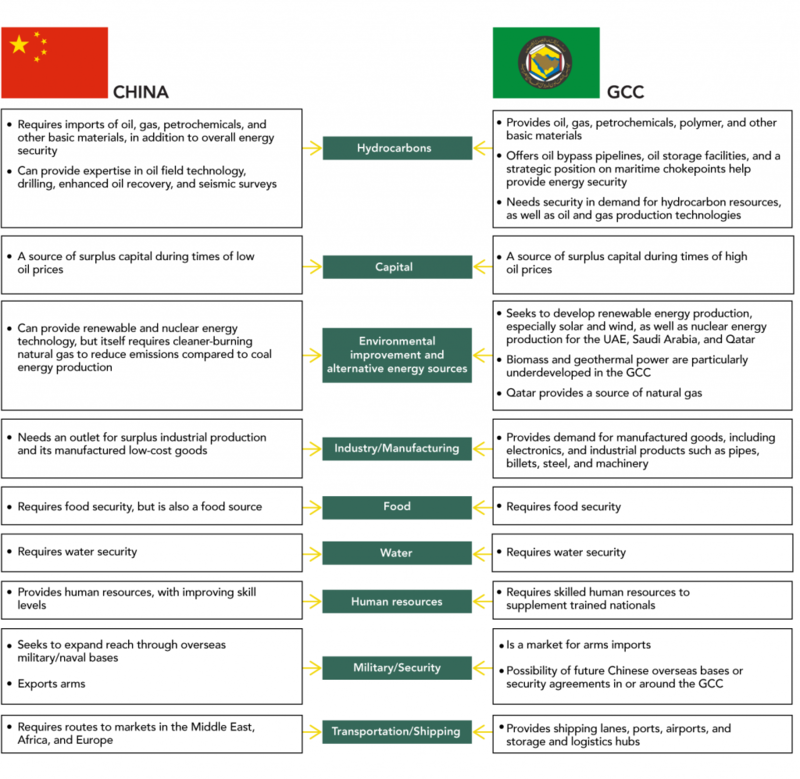 The China-GCC relationship has been broad but rather shallow, confined to trade in oil, gas, and bulk materials one way, and mass-market manufactured goods the other way. Chinese direct investment in GCC energy projects has recently expanded, evidenced by Abu Dhabi Company for Onshore Oil Operations’ onshore oil-producing concession and Khalifa Industrial Zone project in Abu Dhabi, the Jazan refinery project in Saudi Arabia, and the methanol plants and port development in Duqm, Oman, among others. But this is still less than what is seen in other regional energy projects. 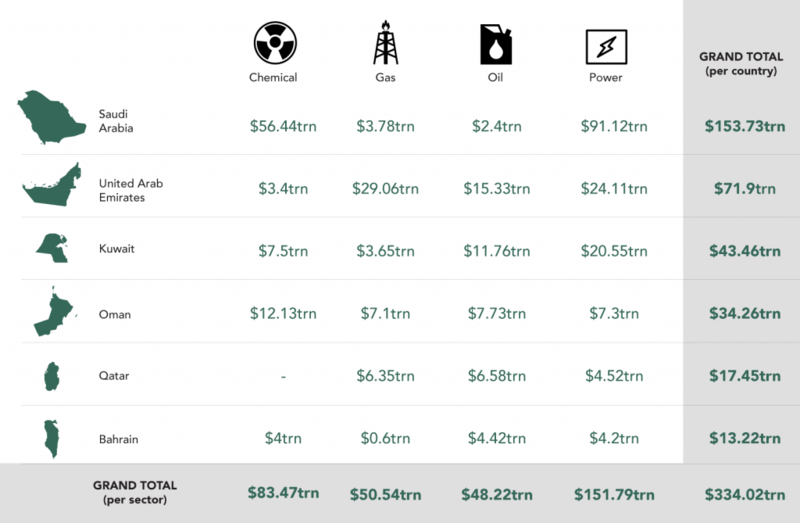 China’s investments in Iraq, Egypt, Pakistan, and especially Iran represent a much larger financial commitment and level of oil and gas production. During a period of uncertainty over energy demand and regional geopolitical turmoil, the BRI can be steered to offer assurance to both China and the GCC states. The Belt and Road Initiative (BRI), previously referred to as One Belt, One Road, is a Chinese initiative consisting of a series of infrastructure networks, financial institutions, and trade and investment projects meant to encourage economic activity in Eurasia and Africa, promote China’s prosperity, and project Chinese influence beyond its borders. The ‘Belt’ refers to the land route from China through Central Asia to Europe, while the ‘Road’ is a maritime route through the Indian Ocean to the Mediterranean. As the figure below shows, the BRI’s infrastructure and trade networks follow several routes. Current representations of the BRI are approximations of its projected path and not a specific ‘map’ of its future layout. However, as it is currently envisioned, the ‘Belt’ and the ‘Road’ each largely bypass the Arabian Peninsula. With a GDP of more than $1.39trn in 2016, the Gulf Co-operation Council (GCC) is a global economic powerhouse that, despite the decline in oil prices, continues to play a significant role in the global economy through its energy exports, fiscal spending, geographic centrality, and diversification efforts. The BRI therefore represents a key consideration for the GCC, with member states welcoming the project and both Saudi and Emirati officials explicitly underlining its significance. For its part, China is open to co-operation with Gulf states and their involvement in the BRI. GCC-Chinese ties continue to grow, as both sides view the other as critical trading partners. This openness creates an impetus for GCC states to seek areas of co-operation and examine opportunities and synergies that could emerge from their participation in the BRI. Toward that end, the GCC has made an effort to reach out to China, emphasising the importance of moving beyond simple trade relationships to a broader strategic partnership. Much is on the line for the GCC, as energy is the lynchpin of the bloc’s exports. The same is true of many other states along the BRI. And while the GCC is already indirectly connected to the BRI route through its trade relations with key countries, a more direct role would have a lasting economic and political impact on the region. Does the GCC have a sustainable role to play in the BRI? If so, how can it move beyond consolidation to expand its role across new geographies as well as sectors? This paper will seek to answer this question as the GCC prepares for the impact of this initiative. 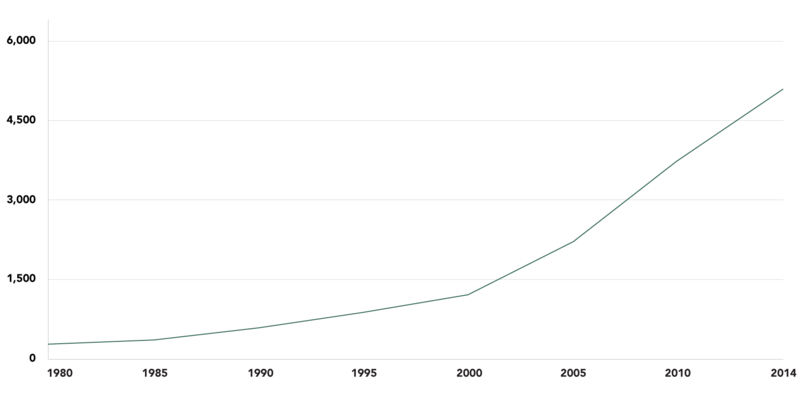 Development in China has proceeded at a dizzying pace over the past three decades. With more than 9% yearly GDP growth on average during that time period, the country accomplished the “fastest sustained expansion by a major economy in history”. This growth has required energy in ever-increasing amounts. In 1985, China consumed 351bn KWh of electricity, but by 2016 this had increased to 5.92trn KWh, a more than 14-fold increase. This considerable rise in energy consumption is owed to the fact that secondary industry, including manufacturing and construction, makes up a large component of China’s GDP – about 41% in 2016. 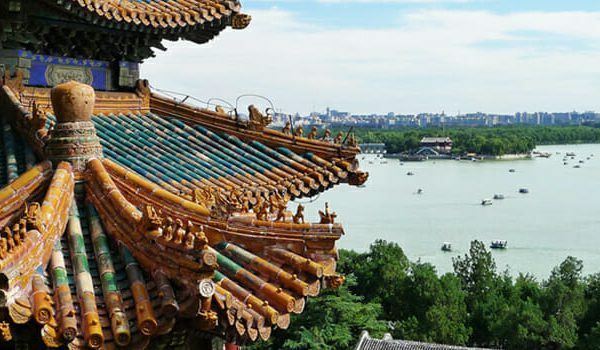 During this period, China underwent a construction boom, expanding and building entirely new cities throughout the country, fed by energy-intensive concrete, steel, aluminium, copper, and plastic production. China has also seen rapidly increasing demand for refined petroleum products, including diesel, gasoline, and jet fuel. The number of passenger vehicles sold almost quadrupled between 2008 and 2016, with 24.4m vehicles sold in 2016. Air travel has also risen significantly, with aircraft departures from China more than doubling since 2008 due to the country’s emergence as a regional aviation hub and flights becoming more affordable. To fulfil these energy requirements, China has moved from a net exporter of oil to the world’s largest importer, vying with the United States for top position. Beijing imported an average of 8.55m barrels per day (bpd) during the first six months of 2017, a 13.8% rise compared to the same period in 2016. In the 10 years prior, China set a new record for oil imports each year. In terms of gas, although this only makes up 6-7% of its total energy consumption, particularly low for a major economy, China is still the third-largest importer of liquefied natural gas (LNG) in the world, accounting for 12% of global imports – with this seeing a 35% rise in recent years as the country tries to displace dirtier-burning coal. Part of the massive increase in oil imports is due to China’s efforts to fill its strategic petroleum reserve. Once satisfied, imports may slow slightly, but China has continued to purchase more storage capacity, suggesting there is still room for expansion. Demand from smaller, independent, less sophisticated ‘teapot’ refineries, which surged after the government allowed these refiners to purchase foreign oil, also drives imports. At the same time, China’s own domestic oil production continues to drop, hitting a record low in May 2017. The country’s older oilfields require significant investment to continue production, and capital investment has declined, with further spending in some recovery techniques unviable at current relatively low oil prices. Thus, imported oil is required to replace this dwindling production capacity. China’s prodigious economic growth rate is also expected to slow slightly, but high demand within the country and worldwide for Chinese-made products is anticipated to continue, and with it China’s energy requirements will expand. 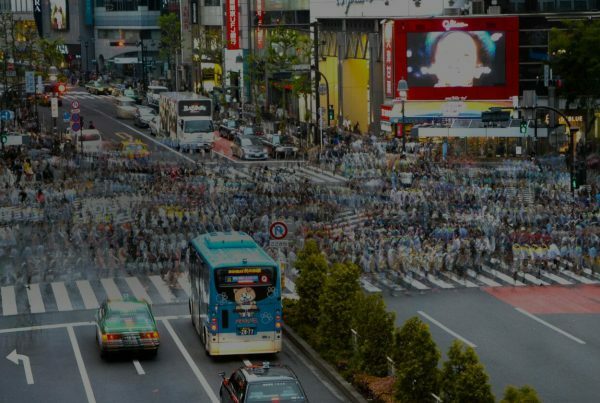 Its own forecasts suggest total energy demand will peak in 2040, owing in particular to transportation requirements, with demand for oil peaking in 2030. Although China has pledged to adopt cleaner fuels in place of coal and to gradually phase out oil-fuelled vehicles as part of an effort to curb emissions and pollution, this is likely to shift, rather than reduce, energy imports in the mid-term. China is not alone in Asia in seeing rapidly rising energy requirements; the emerging economies of South-east Asia have all seen sharp rises in their consumption. This growing demand is expected to have a relatively limited impact on oil and gas prices, however, due to a slowing of worldwide growth and strong potential supply from select producers in the Middle East such as Iran and Iraq, and from North American shale oil. Although Indonesia and Malaysia are significant exporters of LNG, many producers in the region have had to redirect some of their oil and gas production inward to feed domestic consumption, and others have become net energy importers. Vietnam, for example, is ramping up oil imports as production declines, demand increases, and it brings new refineries online. Although a relatively small importer, at 100,000 bpd in August 2017, this number is expected to grow with development. Annual growth in Indian oil demand, meanwhile, is approaching China’s in absolute terms. For the region overall, the International Energy Agency forecast 80% growth in energy requirements through 2040. 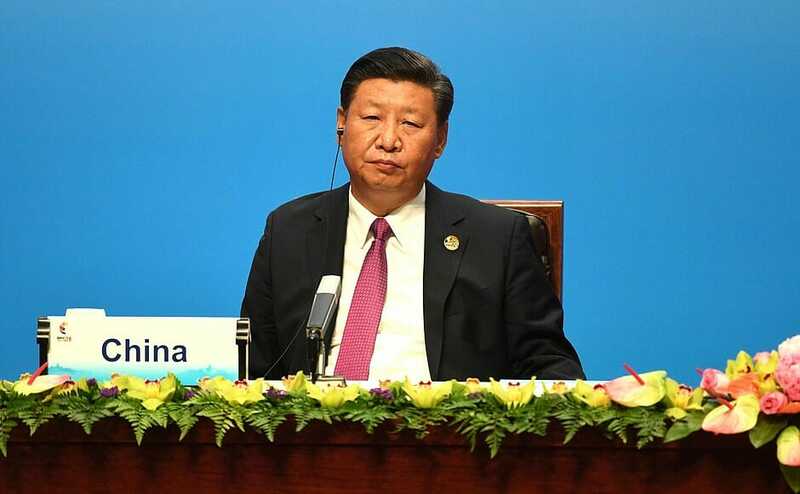 Xi Jinping, president of China and general secretary of the Communist Party, has consolidated his power since taking office in 2012, and is steering China through a potentially tricky period of economic rebalancing and slowing growth. The BRI is a political project for Xi, a massive and global undertaking that will cement China’s international standing. But economic motivations are no less significant – indeed, the political and economic are entwined – with access to energy resources key among them. China is expected to be dependent on oil and gas for 67% of its energy needs by 2020, and maintaining effective corridors for acquiring those resources is a vital aspect of the BRI. The BRI is not solely about directing energy resources to China itself, but facilitating the flow of energy among and through the participating countries. Energy projects as part of the BRI provide an outlet for China and Chinese state-linked oil companies to launch investments overseas. As one of the world’s most critical industries and one that is key to virtually all other endeavours, the intended reshaping of the Eurasian and global economic map inevitably involves control over the flows of energy. A natural area of co-operation for China and the GCC is the energy sector – particularly oil and gas – but this also extends to renewable energy and energy-intensive products such as petrochemicals, iron and steel, aluminium, fertilisers, and cement. One of Saudi Vision 2030’s main endeavours is to segue towards cleaner sources of energy – renewables and nuclear – and the kingdom is looking to invest billions of dollars in wind and solar energy. Using its sovereign wealth funds, Saudi Arabia has begun acquiring positions in Chinese publicly traded wind and solar companies, setting the tone for further renewable energy partnerships. Chinese firm Ningxia Zhongke Jiaye New Energy and Technology Management is set to begin construction on a $94m, 1-GW-per-year solar panel factory in Oman’s Duqm special economic zone by the year’s end. This, and a plethora of other Chinese investments in Oman, will aid the country in reaching its Vision 2040 goals. Through its New Kuwait 2035 strategy, the country is looking to shift away from its historical economic dependence on the oil sector. This includes new projects on renewable energy such as the massive Shagaya Project, which consists of wind and solar energy initiatives. The Kuwaiti government will also develop five islands into free trade zones, which, according to Chinese Ambassador Wang Di, perfectly complements the BRI. In line with the UAE’s Energy Plan 2050, China’s Jinko Solar and Japan’s Marubeni are constructing Abu Dhabi’s 1.17-GW Sweihan Solar Plant, and Shanghai Electric, in partnership with private Saudi firm Acwa Power, recently won a bid for Dubai’s 700-MW concentrated solar power plant. These investments help solidify the base for greater GCC-China co-operation and, more importantly, set the backdrop poignantly for the incoming BRI to most effectively meet the GCC’s local needs and provide it with opportunities to act abroad. The GCC countries have plans to expand their energy infrastructure with an estimated $564bn project pipeline, 41% of which is in the power industry. Much of this will have to be financed externally, given the reduction in oil revenues since 2014. An essential part of the BRI is connectivity, including ports, pipelines, and LNG terminals. For example, parallel gas and oil pipelines running from Myanmar to Yunnan Province in China are now operational and allow tankers to bypass the Straits of Malacca. An LNG import terminal in Gwadar, Pakistan is also planned, along with a gas pipeline linking Iran to central Pakistan, which will be constructed by Chinese companies. Some projects, however, may prove to be less feasible. A planned pipeline to carry oil from Gwadar to China’s Xinjiang region may be more expensive than simply carrying the oil via ship to Chinese ports. Regardless, if some projects do not come to fruition, Chinese construction companies are activearound the world, especially in Central Asia and Africa, and the BRI will build on this expertise to further develop the international capacity of Chinese firms. The possibility of GCC investment in states along the BRI, as well as Chinese investment in BRI projects in the GCC, presents an opportunity for both sides involved. This investment typically involves a mix of foreign direct investment (equity stakes in projects and assets), debt funding (typically supplied by Chinese entities, which often do not distinguish much between debt and equity financing), and equity investment at the company level, such as minority stakes in listed companies. 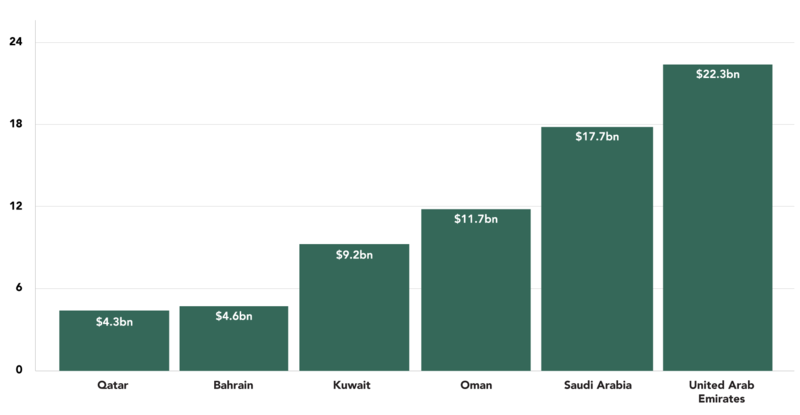 Trade between the GCC states and China is quite healthy at about $240bn. Chinese energy-related investments in the region are also notable; for example China’s Harbin Electric’s is developing the 2.4-GW Hassyan coal power station in Dubai. With such strong trade relations, burgeoning Chinese investments in the GCC region, and good diplomatic relations, the BRI has an already solid foundation to make greater investments in the GCC’s energy sectors. This opportunity will create new export avenues for Chinese companies, while reciprocally cementing Gulf exports of oil, gas, and other materials to China. One such example is the deal signed on July 31, 2017 between Abu Dhabi Ports and Jiangsu Provincial Overseas Co-operation and Investment Company, which involves a $300m manufacturing operation in Khalifa Port’s free trade zone. When it materialises, this deal will result in Chinese companies occupying 2.2m sq metres of space in the free trade zone. Five Chinese companies from various sectors, including clean energy, environmental clean-up technologies, and mining, are currently on board. With regards to the BRI, Jiangsu Province is an extremely active component with various overland and maritime projects coming through it. Saudi Arabia, Qatar, Oman, and the UAE are also members of the Asian Infrastructure Investment Bank (AIIB), the key multilateral financing institution for the BRI, while Kuwait and Bahrain are both prospective members. The AIIB, although headquartered in Beijing, has a growing membership and is not directly controlled by China. It is, however, a major soft power success to accompany the BRI and supplement existing multilateral financing institutions. 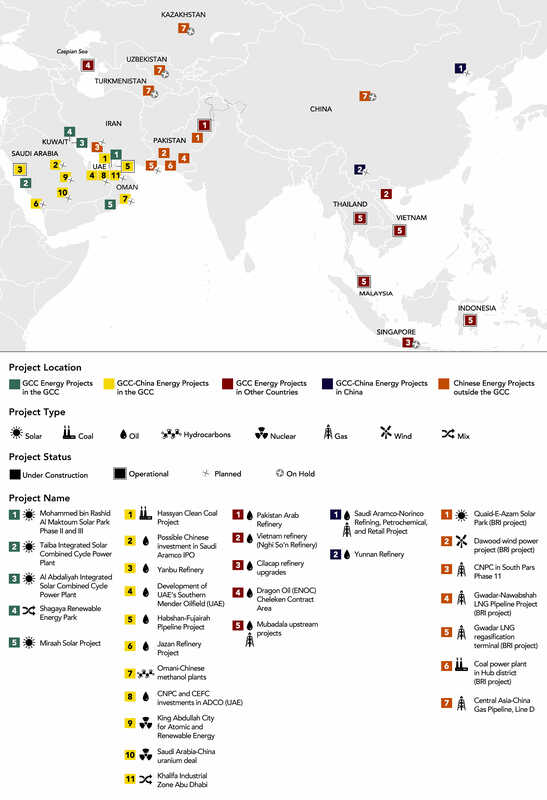 Chinese energy activity in the BRI states, and in the GCC, is conducted through various entities. The main state oil companies – the China National Petroleum Corporation (CNPC) and its subsidiaries, PetroChina, Sinopec, and the China National Offshore Oil Corporation – have long invested in BRI countries such as Iran and Kazakhstan. They have also built strong positions in Iraq and begun to grow their presence in the GCC. Alongside them, there is also a relative newcomer, CEFC, which took a stake in Abu Dhabi Company for Onshore Oil Operations (ADCO) and has other oil storage and refining assets. 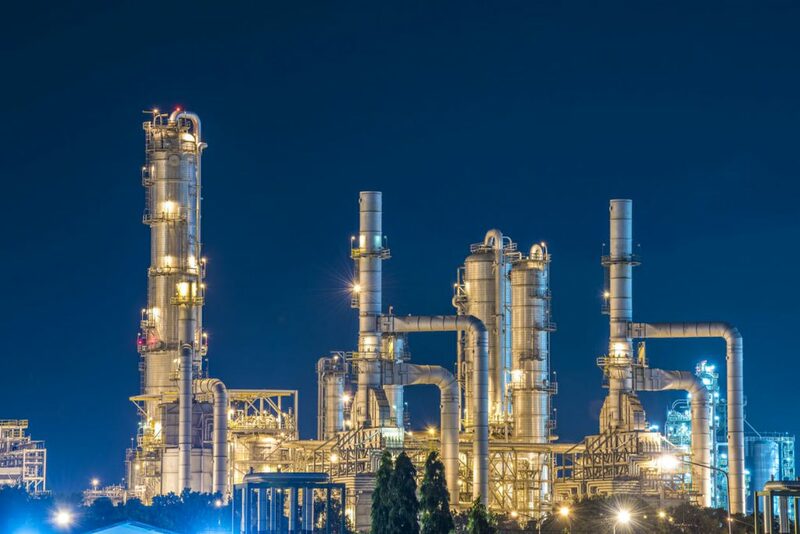 Another key Chinese player is Sinochem, which is in merger talks with ChemChina to form the world’s biggest industrial chemicals company and has upstream petroleum interests in the UAE and Syria, among other countries. Chinese oil services and engineering firms, which would carry out projects such as pipeline construction, are often closely affiliated with one of the oil majors. Investments by Dubai Ports World in several Chinese ports and logistics centres in Qingdao, Tianjin, Hong Kong, and Yantai. Fulfilling the potential of the BRI should not simply be about expanding existing trade flows for either China or the GCC. For the GCC in particular, developing stronger connections with diversified and future-proof economies, such as China and others along the BRI, is pivotal. China is the world’s largest importer of crude oil, second-largest importer of ethylene, and third-largest importer of LNG. It buys the majority of Omani crude oil exports. 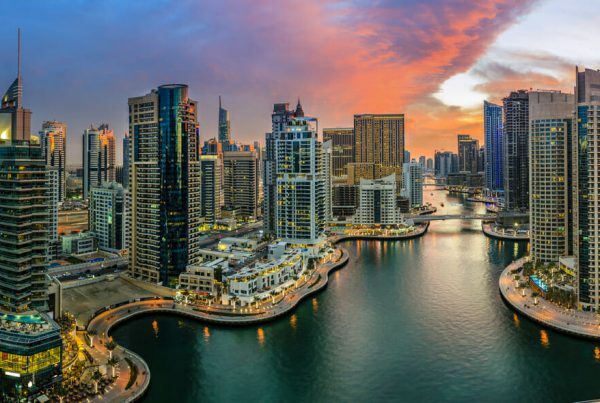 Meanwhile, the UAE is the world’s third-largest exporter of cement and fourth-largest exporter of aluminium; and Qatar is the world’s largest exporter of liquefied petroleum gas and LNG. There is some divergence of trade patterns among GCC states, particularly when it comes to LNG. The demand for LNG is growing much faster than demand for oil, but only Qatar is a major exporter within the GCC, while Kuwait and the UAE are importers. All of the GCC states, with the exception of Bahrain, are major crude oil exporters. Generation of regional and global public goods (enhanced energy security and environmental benefits). New trade flows and hubs can encompass other countries that are key to the BRI. The construction of the vast new infrastructure required for the BRI also requires raw materials, notably cement, iron, steel, copper, aluminium, and plastics, as well as fuel. Much of this may come from China directly, but even then it will require higher oil and gas inputs that the GCC could provide. For instance, mining giant BHP Billiton says the BRI will require 150m tonnes of steel, but only 10 of the 68 BRI countries are net steel exporters. 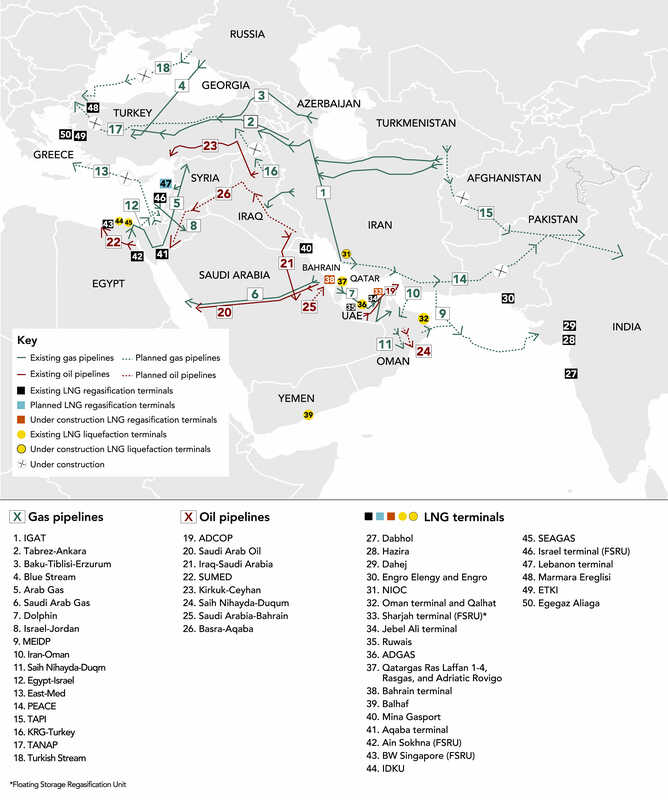 Although the Middle East and North Africa (MENA) possess large hydrocarbon resources, the interconnectivity between regional countries vis-à-vis energy is weak due to a combination of commercial and political obstacles. In 2015, the Arab Fund for Economic and Social Development identified the top-10 potential MENA energy connectivity projects, which could save as much as $127bn. These include seven electricity links costing a total of $3bn from Libya to Egypt; between Yemen, Saudi Arabia, Egypt, and Jordan; and from Kuwait to Iraq. Three gas import projects were also identified at a cost of $2.8bn, including gas pipelines from Iraq to Kuwait and Libya to Egypt, and an LNG import terminal in Bahrain. Further electricity and gas links could help knit the Gulf into a wider network stretching from southern Europe through the Red Sea to western China, bringing a key part of the BRI to fruition. Of course, European and North African countries, and Russia, have their own plans that may complement the BRI framework, or in some cases, duplicate or conflict with it. Such regional energy connectivity has typically been hampered by commercial, political, and security concerns rather than technical or investment barriers. China may in some cases be able to bring partners together, though this would require enhancing its institutional and commercial-diplomatic finesse. Enhancing energy security and logistics is a key goal of the BRI for China. Existing nodes in and around the GCC that could be part of the marine component of the BRI include the Fujairah and Jebel Ali ports in the UAE; the Habshan-Fujairah pipeline, which can carry most of Abu Dhabi’s oil exports to the Indian Ocean port of Fujairah; the petrochemical and refining centre at Yanbu on Saudi Arabia’s Red Sea coast; and the Suez Canal/SUMED pipeline complex in Egypt. Fujairah is already the world’s second-largest bunkering (ship fuelling) terminal, while Jebel Ali is the Middle East’s largest and world’s ninth-largest container port. They thus form a critical part of the Indian Ocean ‘Road’, both as intermediary points along it – contributing fuel, logistic services, and security – and as sources of flows into and off it. Establishment of UAE military bases in Somaliland and Eritrea, near the crucial Bab El Mandeb Strait (which gives access to the Red Sea and the Suez Canal for oil and LNG transit). Saudi Arabia is also building a military base in Djibouti while China has already established a naval base there. For Oman, Iraq, and Egypt, in particular, external financing will be essential for any connectivity or security projects, given their limited financial resources. Many of these projects also require co-operation between several states, including those projects involving Iraq, with whom Saudi Arabia has recently stepped up relations. Further afield, the Gwadar and Myanmar-China pipelines’ key MENA energy routes are under the auspices of the BRI. The connection from Myanmar to landlocked Yunnan Province started trial operations in July, including a cargo of Omani crude. Gwadar and Myanmar allow China’s energy imports from the Middle East and Africa to bypass the Strait of Malacca and the South China Sea, reaching inland China more quickly and securely. The GCC would benefit from adding these and other energy trade connectivity projects as key focal points of co-operation. Another key area of co-operation between the GCC and China is energy technology. Middle Eastern countries including the GCC have historically had issues in effectively exploiting sour gas, shale gas, carbonate reservoirs, and heavy oil. They are also lagging in terms of enhanced oil recovery. In February 2017, CNPC and compatriot CEFC secured stakes in the ADCO concession in Abu Dhabi, the largest onshore oil-producing unit in the emirate. CNPC was already active in the Al Yasat JV with ADNOC. China is also keen on investing in the Saudi Aramco IPO, and has explored for gas in Qatar and Saudi Arabia. In the wider region, the Chinese have large investments in oil production in Iraq, in particular, as well as Egypt, Syria (suspended due to the war), and Iran. Chinese companies have developed particular expertise in carbonate reservoirs, heavy oil, and some types of enhanced oil recovery. China is the world’s third-largest producer of shale gas, even though it remains far behind North America, and it has significant international oil services firms such as BGP (seismic surveys) and Great Wall Drilling (a CNPC subsidiary). Though Chinese companies, in general, do not reach the technical levels of the leading Western firms, they are improving and do offer an alternative. The most effective approach has often proved to be partnerships between Chinese and Western firms, as with BP and CNPC in Iraq’s Rumaila field, and with BP, Total, CNPC, CEFC, and ADNOC in the recently renewed ADCO concession. Beyond hydrocarbons, the Chinese are also augmenting their reach in the field of renewable and nuclear energy. 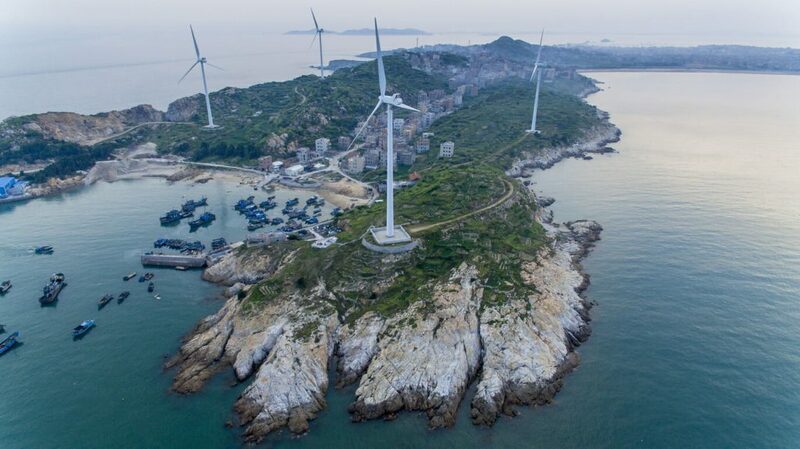 China’s renewable energy sector is growing faster than both nuclear power and fossil fuels. Furthermore, China is the world’s largest exporter of solar panels and the largest seller of plug-in hybrid and electric vehicles at 507,000 vehicles in 2016. China National Nuclear Corporation has signed a co-operation agreement with the Saudi Geological Survey to explore for uranium, and is looking to provide technology to the kingdom’s nascent nuclear power sector. Concurrently, GCC companies such as Acwa Power, Masdar, ALJ/Fotowatio, Access Power, Petrixo, and Neutral Fuels are growing investors in renewable energy internationally, particularly in the Middle East and Africa. The UAE, for example, has invested in numerous renewable energy projects abroad, such as wind farms in Oman and the UK, and a solar plant in Mauritania, demonstrating the GCC’s drive towards a sustainable future vis-à-vis energy. BRI territories through Central and South Asia represent a strong potential market for JVs in solar, wind, hydroelectric, and biomass. These gaps in the development of renewable and traditional energy in the GCC can be potentially filled if the full extent of the BRI is exploited by GCC states. Structuring a productive China-GCC energy relationship around the BRI will be anything but straightforward. Interests are not always perfectly aligned, and other countries within the BRI are sometimes better placed to meet China’s goals. Some of the structural weaknesses of the GCC economies will also hinder co-operation, unless they are addressed. Limited areas of overlap: The GCC is currently important to China as a supplier of oil, gas, and energy-intensive products, and as a market for Chinese-manufactured goods. However, GCC countries are attempting to diversify their own industrial sectors and exports, in which they may compete with China. Unlike countries such as Vietnam, GCC states do not offer low-cost labour that can attract Chinese firms as wages rise at home. Co-operation with China will have to be based on areas of genuine synergy. Lack of ‘Belt’ access: Though well placed and adjacent to the Indian Ocean ‘Road’, the GCC does not offer access to the ‘Belt’ portion of the BRI through Central Asia. The key Chinese partners here are Russia, Iran, Turkey, and Pakistan, the first two of which are major oil and gas producers with their own ambitions. Pipelines are a more expensive and inflexible means of transporting oil over long distances, and tankers are preferred where sea routes are available. However, the landlocked countries of Central Asia have no choice. By contrast, the Gulf countries would not want to lock themselves into China-bound pipelines that would give them no flexibility in end-customer. That said, the GCC’s ongoing poor relations with Iran complicate energy projects in Central Asia that may rely on Iranian transit routes. Given its competing interests with both Iran and Russia, the GCC’s possible role along the Central Asian ‘Belt’ may be limited despite the potential. 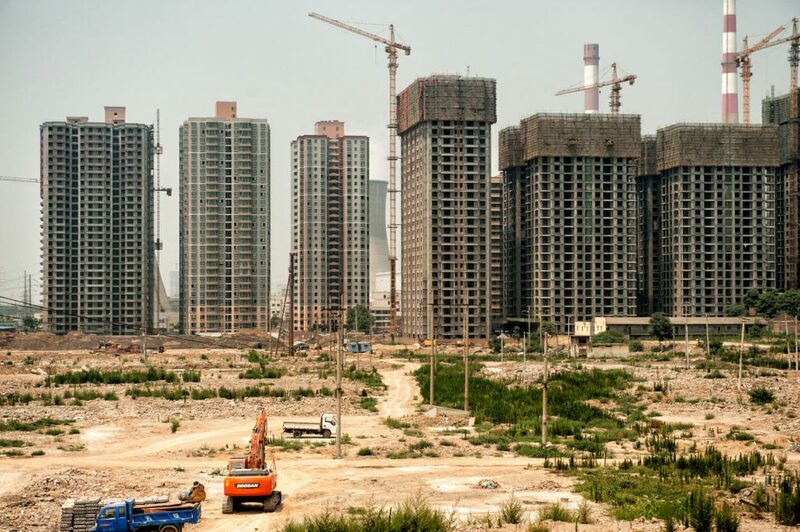 Poor markets: Physical infrastructure, which the Chinese excel at building, is of little use without the supporting commercial contracts and institutions. Indeed, of the 10 intra-MENA electricity and gas connections discussed above (3.3), all but one have failed to come to fruition due to a lack of effective markets, transparent pricing, trust between parties, and agreed rules on trade. For these reasons, even the existing pan-GCC electricity grid is used only a small fraction of its capacity. Intra-GCC political turmoil: The existing intra-GCC dispute with Qatar makes developing a true pan-GCC policy on the BRI challenging in the present political climate. Even if the current issue is concluded in the near future, a common position that appeals to all GCC countries may prove elusive. In its place, specific intra-GCC co-operation can occur, while attempting to avoid zero-sum competition in other ventures such as ports and refineries. With China already by far the more powerful partner in this relationship, opening up to commercial or strategic competition between GCC states would lead to worse terms from Beijing. The GCC, or at least sub-groups within it, should therefore demonstrate additional value to China compared to Beijing’s usual model of bilateral engagement. Despite the current conflict, China has nevertheless engaged in multiple attempts towards diplomatic outreach, indicating it may intend to play a more activerole in the GCC. Lack of information on Chinese entities: The GCC countries have to decide which Chinese entities to engage with, and how. For example, there is competition within the Chinese energy complex for BRI projects, which is highly opaque to outsiders. Furthermore, Chinese oil companies have been embroiled in corruption investigations as part of power struggles at very senior levels within the country and some private companies claim close state connections and access to BRI funding although this can be difficult to confirm. Maintaining energy export diversity: The GCC countries cannot put all – or even most – of their eggs in the Chinese basket. They see it as essential to maintain their key relationship with the US, even though only Saudi Arabia sends much oil there now. Other Asian countries, some of them Chinese rivals such as India, Japan, and Taiwan, are also major customers for GCC energy exports. Although China is the key market, it is not growing fast enough for the Gulf countries to solely rely on for future demand. Moreover, China also engages with other leading energy suppliers and transit countries. Some of these, such as Iran, Turkey, and Russia, are GCC economic and even political rivals; others, such as Pakistan, Malaysia, and Kazakhstan, are countries with which the GCC has good relations. The BRI is an overwhelming and imposing initiative that, if successful, will revolutionise trade as countries know it today. But such a grand initiative encompassing a multitude of different countries with distinct politics and geopolitical alliances is bound to run into predicaments on occasion. Therefore, some predictable and unpredictable problems will inevitably affect parts of the BRI – and even the entire project. Given the disunity within the GCC and the power imbalance between China and the GCC overall – not to mention with individual states – Gulf countries have to consider what kind of energy co-operation is realistic. As much as possible, common positions, JVs, and shared institutions can help to structure engagement with the BRI. The visual below summarises the primary resource opportunities arising from the BRI for both China and the GCC. Stress scenarios are hypothetical scenarios or events that might take place in the foreseeable future. This paper individually describes four distinct stress scenarios, with each one entailing a description of the event that could occur and its predicted general repercussions on the actors involved. After describing a stress scenario, the paper expounds on what the implications of that particular scenario will be on the BRI (‘BRI implications’). This highlights the negative (or positive) effects the scenario could have on the BRI and how China (and other countries) might respond to these. After deliberating on the BRI implications, the paper details the predicted response from the GCC countries with regard to that particular stress scenario (‘GCC response’). This section of the paper, essentially, endeavours to forecast the actions and reactions of the parties involved. Oil prices soar above $100 per barrel due to global rising demand, lower production due to years of underinvestment, and an unexpected crisis in a major oil exporter. Due to the high oil prices, Asian emerging economies feel extreme pressure. China is the most strained, as its economic growth and the legitimacy of its political system come under challenge as deficits grow. To counter the oil crisis, China calls on its GCC partners, especially Saudi Arabia, to give it preferential treatment in these testing times. India, Japan, and South Korea also try to secure a better deal on oil by exploiting their already respectable relationships with GCC countries. Concerned about high oil prices, Asian countries, particularly China, consider whether to bring the strategic stocks they’ve built up over the years into play. China uses the BRI and its investments in energy exporting countries’ infrastructure (energy and non-energy) as a bargaining chip for preferential treatment from the GCC and other oil-producing nations. For China, the BRI becomes the focal point of negotiating new energy deals with countries under the BRI’s umbrella (GCC, Iran, Pakistan, etc.). For the GCC and other BRI countries, the BRI in return promises to continue driving infrastructure development, focusing financing, and, in some cases, granting better market access and a heightened economic and political role in global affairs. With regard to the GCC, one possible avenue discussed between member states and China is the BRI’s maritime route that passes by East Africa and the GCC through the Suez Canal. The GCC demands a more augmented and larger role in this route for more effective access to African markets. The BRI’s ambitious yet positive role acts as a mediator for China and other states, and essentially keeps the BRI alive (and improves it) along with China’s energy security plans – a win-win situation for those involved. For example, the GCC negotiates a more financially enhanced focus on Gwadar Port, which will allow an augmented trade route towards emerging Asian nations. This concurrently helps the GCC counter Iran’s Chabahar Port. The GCC responds to calls from the Chinese and shows willingness to give them preferential treatment. This, however, anchors on the promise of a larger role for the GCC in the BRI. The savvy GCC countries use the opportunity to mould the BRI into something that favours them even further. They do this not only to reap greater benefits for themselves but, more importantly, to counter their rival, Iran, which is geographically central to the BRI. Although post-sanctions Iran is exporting much more oil and gas than before, the collective energy resources of the GCC and China’s heightened requirements give the GCC more leeway at the negotiating table. China, being diplomatic, does not remove Iran from the BRI umbrella but instead, in return for preferential prices, promises increased BRI access and investments in the GCC region and, in doing so, the GCC and China strengthen political and economic ties for the future. Aside from China, the GCC also decides to prioritise energy trade partners with which they have long-standing economic ties or refinery investments. The Chinese credit bubble keeps accumulating and eventually bursts, taking the Chinese economy into a period of stagnation and unemployment due to poor or unchecked fiscal and monetary decisions. As Chinese demand for commodities dries up and capital runs short, the BRI and all projects under its umbrella are jeopardised. An ensuing domino effect undermines the countries most directly and indirectly involved with the BRI (Pakistan and Central Asia), while the price of oil, gas, and other materials slumps. China reluctantly borrows heavily from the IMF, AIIB, World Bank, and other countries to stimulate its economy. China’s regional hegemony and global influence is brought into question, and the US and India take advantage of the resulting vacuum. Due to the BRI’s massive scope – significant funding, major co-ordination on both land and maritime routes, and participation of many countries – the hard landing of China’s economy seriously hampers the initiative. Many projects under the BRI’s umbrella become temporarily or permanently mothballed as funds dry up. Various participating firms and organisations are recalled to China, with many Chinese staff being fired and downsizing prevalent. Many economic deals that were made under the BRI are renegotiated, while others are put on hold or cancelled, negatively affecting the host countries. For example, Pakistan, whose energy demands are dependent on the projects under the BRI – specifically under the China-Pakistan Economic Corridor – continues to suffer a seemingly perpetual power crisis as Chinese engineering, energy, and construction companies depart, leaving projects only half complete. Unemployment and the slump in commodity prices undermine governments and security across Central Asia. This turn of events suits the US, not in an economic sense, as China’s hard landing has global consequences, but more in a geopolitical sense because China’s economic, political, and military influence deteriorates in the Middle East, Central Asia, and Europe. Countries such as India, which are strongly opposed to China’s regional hegemony, swiftly take advantage of an injured China and try to counter the BRI and put the final nail in its coffin. Other regional and global powers such as Russia and the US try to pick up the pieces of the BRI and endeavour to rescue half-complete projects by providing financing or other support. This leads many developing nations to reassess their loyalties as multiple global powers simultaneously fill the vacuum left by the Chinese. China’s future energy security and trade plans, at least in the short term, are postponed as it looks to recover. US global hegemony remains intact while regional hegemony leans towards India as China retreats. Although US influence in the Middle East remains intact, the GCC chooses to rescue some pro-GCC projects under the BRI. Using its remaining sovereign wealth reserves and drawing on international financing, the GCC decides to collectively invest in those BRI projects that had the most value for them – for example, the Abu Dhabi and Jiangsu Province deal. Under a dormant BRI, Iran’s Chabahar Port gets renewed attention and even more investment via Indian involvement. Simultaneously, Pakistan loses most of its funding for Gwadar Port, the LNG terminal, and other infrastructure projects related to the port. This affects not only Pakistan but the GCC too it loses its enhanced access to associated energy markets. This example and others lead the GCC to team up to bail out pro-GCC BRI projects to ensure an optimal flow of energy exports and food and water imports. This eventually leads to deals being negotiated between the GCC and China where GCC countries propose to fund some beneficial BRI projects, and in return China agrees to export steel, iron, and manufactured and agricultural products to the GCC at a discounted rate. Thus, under GCC funding, some BRI projects are restored, which helps stimulate Chinese growth and concurrently allows the GCC to enjoy preferential treatment and the dividends from the rescued BRI projects. Doing such a favour will not go unappreciated by the Chinese once their economy eventually recovers. Furthermore, due to its strong position at the negotiating table, the GCC’s previously limited BRI exposure increases. This way, Iran, which was a central BRI participant, is also kept in check. After a successful independence referendum in 2017, the Kurdistan Regional Government (KRG) later declares an independent state. Turkey mobilises forces into northern Syria and masses along the border with Iraq. Iran also positions forces near the Kurdish region to forestall Iranian Kurdish irredentist movements. Russia threatens Turkey for its incursions into Syria. China seeks to calm tensions and attempts to convene negotiations between the various parties and offers to deploy peace-keeping forces. Turkish military activity escalates and leads to Turkey invoking Article 5, calling upon the US and its NATO allies to deploy to its south-eastern border. This causes a breakdown in trade along the Iran-Iraq-Syria-Turkey portion of the BRI route and armed skirmishes cause some damage to infrastructure along the BRI. Tensions are heightened by Chinese and US military forces operating in close quarters. Transport along this route is physically interrupted by security threats emerging from the standoff. Significantly, insurers raise the rates required to transit this route, thereby making whole sections no longer economically viable for some cargoes. Co-ordination of ‘hard’ infrastructure assets is impinged by breakdowns in communication between Turkey and regional neighbours, and some projects now fall in areas between Iraqi federal government and Kurdish control. Chinese investment in Iraqi Kurdistan, which had been pragmatically conducted up until the present, is jeopardised. China is pushed to declare a stance on Kurdish autonomy, despite its general aversion to entering domestic political issues. The GCC, and the UAE in particular, has a mixed reaction: The UAE has longstanding ties to the KRG and significant investments there, but it is also growing its relationship with Iraq’s federal government. The UAE favours a result that causes Turkey to pull back from its regional role and distracts Iran from some of its regional deployments. 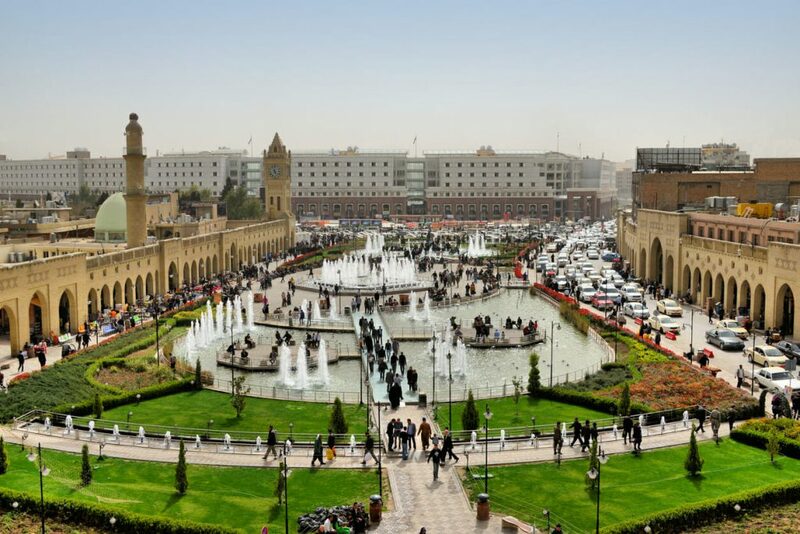 Saudi Arabia, meanwhile, seeks to increase its influence in Iraq but is also concerned about being forced to take sides, the possibility of greater Iranian influence in Baghdad, and the deepening of common interests between Iran and Turkey. In response to the crisis, as Kurdish and Northern Iraqi oil exports are interrupted, prices rise – benefiting the UAE and its Gulf allies, but putting pressure on China’s budget. As the land route becomes unusable, China looks south to expand the available sea routes. The GCC seeks to participate in negotiations to calm tensions, using its friendly relations with the KRG to serve as a mediator. However, although increased oil prices and political pressure on Turkey and Iran are both positive outcomes, the GCC does not rush to fully resolve the issue and instead allows it to play out as long as matters remain relatively peaceful. Instead, the GCC lobbies for alternate routes to expand the BRI. Gulf ports in the UAE, Oman, and Saudi Arabia could be involved in bypassing the land route and reinforcing or providing an alternate branch to the existing sea route. Creative solutions are put forward, including a partial sea route that circumvents Iran and seeks new land routes through the Gulf or other Arab states, such as newly constructed highways or train routes through the Empty Quarter. 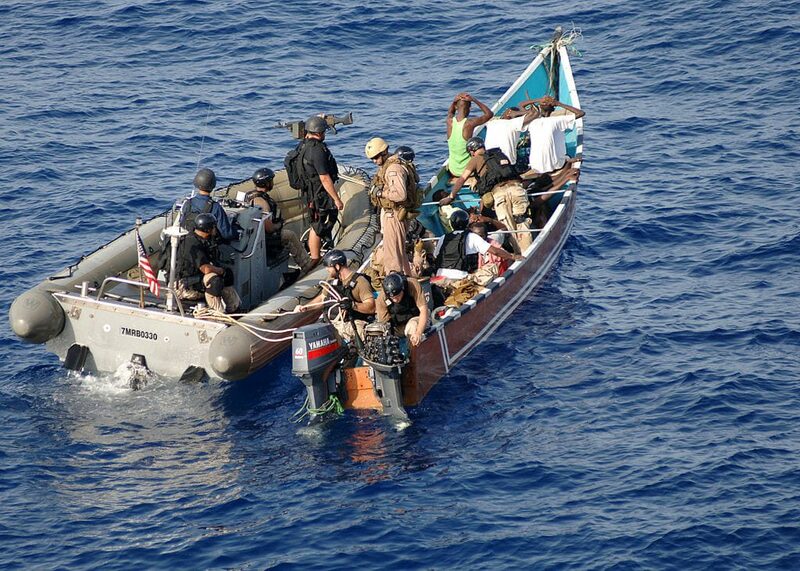 As shipping increases and naval assets previously deployed around the Horn of Africa to provide security are redirected to the Arabian Gulf (to support anti-Daesh missions and counter Iranian naval manoeuvres in the case of the US) and the Mediterranean (to interdict human trafficking in the case of European partners), piracy along the BRI sea route increases. In particular, pirates from Somalia and the greater Horn of Africa, as well as from the still-divided Yemeni state, create problems for shipping along the route travelling towards the Suez Canal and south to Kenya and Tanzania. Shipping insurance rates rise for cargoes travelling in this area, putting pressure on shippers. These shipping routes are not only used for the BRI but are also a major thoroughfare for global trade. The impact of increased piracy on shipping is thus significant, but the precise effect will depend somewhat on global oil prices. Shipping companies temporarily seek to reroute cargo traffic – around Cape Town, for example – leading some portions of the maritime route to be unaffected. However, it raises costs for oil and LNG shipments. Instead, security infrastructure needs to be expanded in terms of both the ‘hard’ and ‘soft’ components of physical facilities and security and trade agreements. China has already taken a concrete step in this respect by establishing a military base in Djibouti. It expands further, constructing additional military facilities in other countries along the route, including Yemen, to project force and protect international shipping. To avoid shouldering the security burden alone, China proposes a combined anti-piracy task force working with American, European, and Arab partners. India also feels it should be involved, but has to insist on its inclusion against Chinese reluctance. The UAE, in particular, takes the opportunity to invest in additional maritime security infrastructure, adding to existing facilities in Berbera, Somaliland, and Assab Port in Eritrea, while potentially constructing new facilities in other locations. Saudi Arabia may increase forces stationed in Djibouti and the UAE may strengthen its co-operation with UAE-supported anti-piracy forces in Puntland. This is an acceptable compromise given American unease surrounding their forces’ proximity to Chinese troops. However, this is an expensive endeavour and therefore additional arrangements are sought to provide either some financial backing for the military expansion or as leverage to seek expanded access to the BRI for Gulf states. The Gulf also pushes for investment in Yemeni ports and infrastructure to support Yemen’s need for massive post-conflict reconstruction as the conflict there winds down. GCC participation in at least some aspects of the BRI would appear to be a win-win for the respective parties. The GCC offers many benefits to the proposed BRI: Its member states have resilient financial sectors, and are politically stable and low risk. They offer a central geographic location, with aviation hubs in the UAE and Qatar; existing major ports such as Jebel Ali, Khalifa, Fujairah, Jubail, Sohar, Duqm, and Yanbu; and coastlines facing the Arabian Gulf and Red Sea. The GCC has strong bilateral relations and trade and investment ties with China. There is also a growing financial relationship: The Renminbi Clearing Centre in Doha was established in 2015, the same year the Industrial and Commercial Bank of China opened a branch in Riyadh. The GCC can offer a significant supply of petrochemical and energy exports to feed China’s growing demand, as well as a site to jointly develop renewable energy resources. Finally, the GCC has close ties to Pakistan, a priority partner for China, and proximity to Pakistan’s Gwadar Port, which is a strategic hub for China-GCC trade. However, the GCC is not directly situated on the two broad BRI routes as they’re currently envisioned. Despite being a long-standing trading partner for the GCC, China may not be the most objective facilitator between the GCC and Iran on BRI projects since it views Iran as one of the most importantcountries on the BRI route to Europe. Weak intra-MENA energy interconnectivity and intra-GCC political divisions could also block further economic integration and co-operation. The hypothetical stress scenarios described in section four shed light on some trends that may impact the development of the BRI and the GCC’s participation in it. The GCC may be wary of the BRI strengthening Iran and Turkey’s influence in the region and might sense a threat in the BRI bringing competing sources of energy supply to China and Asia from Russia and Central Asia. Gwadar Port, despite being a key hub for trade with the GCC, could also be a source of competition for established Gulf ports, especially in the UAE. The ongoing GCC dispute with Qatar could make China wary of being entangled in regional conflicts given its LNG imports from Qatar. A future low-oil price environment could also threaten the Gulf’s ability or desire to participate in the BRI. Yet there are many significant opportunities that could arise from participation. The BRI would develop a strategic relationship with China based on Beijing’s reliance on the GCC for energy security. For its part, Russia has been keen to embrace the BRI to further its interests in terms of investment in technology. China may not wish to put all its Middle East energy eggs in Iran and Iraq’s baskets, given concerns over political stability and external relations. Co-operation with China could generate investment in the upstream sector, as is already occurring in Abu Dhabi, and support technological advancement in oilfield services. The BRI could also be a driving force behind regional energy integration, including gas pipelines, electricity transmission, and strategic energy security initiatives such as storage facilities. Development along the BRI would boost energy demand in, and trade relations with, target BRI countries and regions such as Pakistan, Bangladesh, and East Africa. The BRI dovetails with proposed initiatives such as the Saudi ‘land bridge’ transport route concept, and pairs well with existing GCC investments such as Saudi- and UAE-supported development in Egypt, thereby reinforcing strategic policy goals supporting Egypt’s stability. The BRI could also complement the various national strategic plans of GCC countries, promoting investment in infrastructure, transportation, energy diversification, and renewable energy. Overall, the BRI’s opportunities likely outweigh potential risks, and the GCC should continue its efforts to participate in this potentially significant regional development strategy. Robin Mills is the chief executive officer of Qamar Energy; Roa Ibrahim is a consultant; Sarmad Ishfaq is a researcher in international relations with a special focus on South Asia and the Middle East; and Aaron Reese is a former senior analyst at The Delma Institute.